iPhone and iPod touch software, games, toys, calculators and web applications by Kudit: Software updates kill your third-party apps? ATLANTA, Georgia — October 1, 2007 — Miss Five Dice? Scared about bricking your iPhone or iPod touch? Remember, Kudits will never "brick" your iPhone or iPod touch nor will it be removed or disabled by software updates. All fully compatible with iPhone firmware 1.1.1! 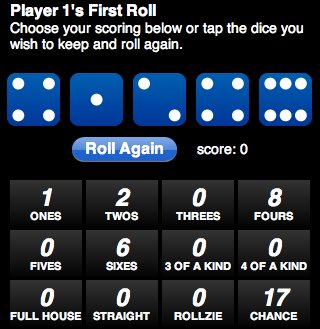 Our Yahtzee-like dice game can be played with any number of people and works great in both portrait and landscape modes! The category and application select screens work in landscape orientation. We've added animation effects to Chain Reaction.